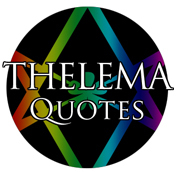 Thelema Quotes’ eighteenth installment deals with politics. As always, all quotes are from Aleister Crowley or The Book of the Law. “It is evident to all serious thinkers that the only hope of saving mankind from a catastrophe so complete that the very name of civilization will perish is in the appearance of a new religion. “Democracy dodders. Ferocious Fascism, cackling Communism, equally frauds, cavort crazily all over the globe. They are hemming us in. They are abortive births of the Child, the New Aeon of Horus. Liberty stirs once more in the womb of Time. Evolution makes its changes by anti-Socialistic ways. The “abnormal” man who foresees the trend of the times and adapts circumstance intelligently, is laughed at, persecuted, often destroyed by the herd; but he and his heirs, when the crisis comes, are survivors. Above us today hangs a danger never yet paralleled in history. We suppress the individual in more and more ways. We think in terms of the herd. War no longer kills soldiers; it kills all indiscriminately. Every new measure of the most democratic and autocratic govenments is Communistic in essence. It is always restriction. We are all treated as imbecile children. Dora, the Shops Act, the Motoring Laws, Sunday suffocation, the Censorship— they won’t trust us to cross the roads at will. Fascism is like Communism, and dishonest into the bargain. The dictators suppress all art, literature, theatre, music, news, that does not meet their requirements; yet the world only moves by the light of genius. The herd will be destroyed in mass. The establishment of the Law of Thelema is the only way to preserve individual liberty and to assure the future of the race. In the words of the famous paradox of the Comte de Fénix— The absolute rule of the state shall be a function of the absolute liberty of each individual will. Feel free to leave your thoughts on these quotations and suggestions for future topics in the comments.